I talked about this before but I've really cut back on my clothing shopping since a major closet cleanout last year. I still add new pieces but I try to be deliberate with quality pieces and styles that I can still wear years from now. The last time I added to my wardrobe, it was a few classic black items but I have spring on my mind with these recent additions. This is the first plaid shirt I've owned since college. Back then I had one that I got while interning at Ralph Lauren that I wore until it was practically threadbare. I like that this is a pastel plaid. J. Crew boy fit shirts run huge. I had to go down two sizes for a fitted look. A fun new silhouette with a higher waist and a little kick flare. These jeans are so flattering and comfortable and I've been wearing them a lot lately. Runs true to size. I got the striped version of this skirt last year which I wore it all the time. 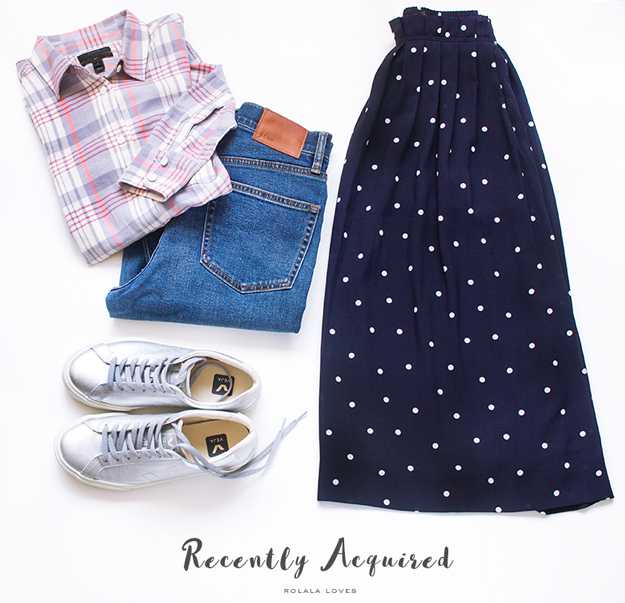 I think this navy polka skirt will be just as classic and versatile. I love the midi length and it has pockets! This skirt is generously sized so I went down one size. I was considering getting a pair of Adidas Stan Smith sneakers until I spotted these silver kicks and fell in love. And I love them even more in person. These sneakers not only look super cool but they're eco-friendly as well. They're going to look so cute with skirts and dresses as well as with more casual looks! These only come in whole sizes and run large. What do you think of my new additions? Have you bought any clothing/accessories recently? I like J. Crew a lot! The skirt looks really great. I wish there was a store near where I live but the closest one is in Paris... Have a great week. I really like the sneakers! That midi skirt is so pretty and such a classic! Great buy! J Crew rocks love the items you purchase. 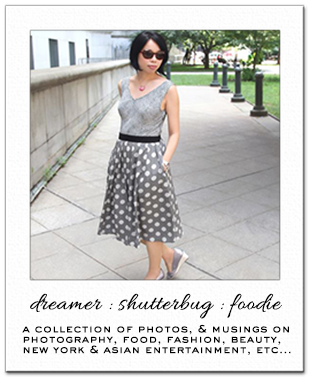 Such great classic pieces, Rowena:) And those sneakers are everything! I totally adore that skirt and I'm pretty sure I need that shirt too:) Happy Monday, sweetie. Very nice purchases Rowena! I am in love with that polka dot skirt. How CUTE is it! Enjoy wearing everything. all great choices. i am super fond of the skirt! I like your polca dot skirt and sneakers! Nice addition to your closet, I think my fav item is that midi skirt, but that shouldn't be a surprise since I'm a big fan of midi skirts. This flanner shirt looks very stylish as well, it is one of those items that always come in handy. I don't have one of my own at the moment, but there are a few I can steal from hubby, so that's settled:). I really like those silver sneakers. They have such a pretty shade to them, something whitish and metallish about them but still silver...how gorgeous. Bonus points for being eco-friendly. To tell you the truth, I didn't buy anything lately. I think the last time I bought something was back in January (two pairs of flare jeans). I guess I'm at a phase in my life when I feel like I have enough things in my closet. Next year I might make some new investments. I did receive one floral dress as a present from a friend for my birthday about a week ago. I didn't wear it yet but I probably will as soon as the weather stops being so wintery. I really like your style, Rowena and each piece are timeless and can be worn regardless the current trend. I need to go shopping for clothes again too, it's been some time since I went clothes shopping. Great choices! I especially like the sneakers & I'm usually not into metallic shoes. Oh haha I just got a pair of Adidas, they run SMALL, if you loo online a lot of people say they run big but they don't I had to get another pair. And these kicks are SO COOL! And yes I hear you about social media, I am getting sick of it too. Many say that blogging is going to replaced by IG and that is all anyone is going to do. Not sure about if that will actually happen but if so I would delete IG account. It is cool but not that cool. I love the midi skirt and sneakers! Cool addition to your closet. I am so loving everything you've acquired. Especially those sneakers and those jeans. I just love the basics girl. Love this Rowena. I don't believe I've caught your post like this before but I love it. Lately I also lean more timeless pieces, but sometimes I can not help but fall into temptation of trends, I like the shirt and sneakers! I want that midi skirt! Love it so much! The demi boot crop jean is adorable! I've just re-discovered J. Crew and some things are sold out online so I'm really hoping I can find a few things in store! I love that skirt too!! It's cute and classic! I couldn't agree more with your quality over quantity philosophy - I've cut on my clothes shopping considerably, too. I'm really into midi skirts right now, and this one looks just perfect! Can't wait to see how you wear it! I love the J Crew shirt and the sneakers. The length of the skirt is everything. Great finds. I need that shirt in my life! Love your new pieces and like you I deliberately choose quality and timeless pieces that I can still wear years from now.